Microsoft Project 2010 Standard remains a very popular project?management solution despite being introduced in 2009. This version has many of the features that are seen in subsequent releases of Project including the Ribbon tab interface and the ability to use Microsoft Backstage to access additional tools, templates and other program options. This software is perfect for businesses in need of a sound project?management tool that will not break the business budget. 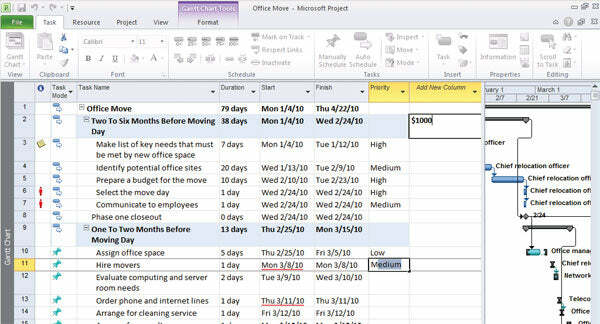 Project?managers will able to save files to SharePoint, allowing for team collaboration on projects and managers will effectively be able to draft, edit and save project timelines. This is the first version of Project that offered the ability to work with Project Office Server. Ease of use makes this a great program for use by project?managers and team members alike. Productivity and project completion will certainly improve with the use of this software. Microsoft Project Standard 2010?is a project managing software which gives Microsoft project managers a new and easier way to manage projects. With significant updates and visual enhancements, this?project manager software delivers better experiences to simply be more productive and successfully complete all types of projects.? Work more efficiently with the simple and intuitive Microsoft Fluent user interface? ?new graphical menus and a familiar experience provide the tools you need to plan and manage your project. Task-oriented tabs and contextual menu groupings reveal powerful features, making it easier to get started and realize results. Learn about features and rich formatting controls quickly with descriptive tooltips and drop-down galleries. Simply be more productive by choosing your own menu options, quick access toolbar settings and setting defaults. Save to XPS or PDF. Quickly share, print, and publish project information from one location using the new Microsoft Office Backstage view. Enhanced copy and paste makes it easy to share information effectively with other Microsoft Office applications while retaining formatting. Add columns dynamically by entering data without having to first select the data type. Simplify data entry with auto-complete which displays a list of previously used values to select from. Microsoft Project Standard 2010 gives you a new and easier way to manage projects. With significant updates and visual enhancements, Project Standard 2010 delivers better experiences to simply be more productive and successfully complete all types of projects. I want to thank the sales team for taking good care of us. I was looking for the best deal on MS Project I could find for 6 users. My Choice Software gave us such a great deal and upgraded us to the Professional version that I will always call them first. Their support team could have been a lot more helpful, but again, I contacted our sales person when a few of our team was having install difficulties and they did all they could to help us out. Looking forward to doing business with them on our next software purchase. Had no issues, great deal. Make sure you select the proper version (32 vs 64 bit). I have a 64 bit OS, but my MS Office version was 32bit so I had to download the 32 bit version. Downloaded in seconds. Works perfectly. Downloading and installation went very well with no issues. I was pleasantly surprised and happy with the product and procedures. I also will recommend to others.